Jedi - I understand those guys working on your comm mast (in the picture) are hired guns. But where did you find place to attach the crane/lift - is it on the rail? And would aluminum not be a better choice for the comm mast? I can see from here it is 'only' galvanized steel! But the fun aside, I think these pictures clearly show that the UBNT radio's are not like the toys you buy in your local computer shop and used in professional ISP configurations. The days of using coax on wireless devices have died (as they should). Connecting a Wi-Fi device directly to the antenna sends all of the power straight out the antenna where its best used. And it improves receive as well. I've installed marina Wi-Fi systems and can't count the number of issues that people had with antennas with USB devices trailing below, hoisted up halyards trying to connect. While there's the initial thrill of getting it to work, it's quickly replaced by the work of hoisting every time you want to check email, etc. Perhaps when I find some time, I'll give some of the other common problems and remedies we've discovered. This thread is +2yrs old and long time since there was an update, does anyone know if the technology is still the same and islandtimepc and wififorboats are still the simplest cost effective solution? Those are the still the best solutions for long-range wifi. If you're just looking for low-to-medium range wifi, a great "ease of use" solution is to use a portable mifi/wifi router similar to this (but there are many different versions and types) They can pickup wifi, 3g, 4g, or whatever, and turn into basestation for wifi on the boat. Very cheap. 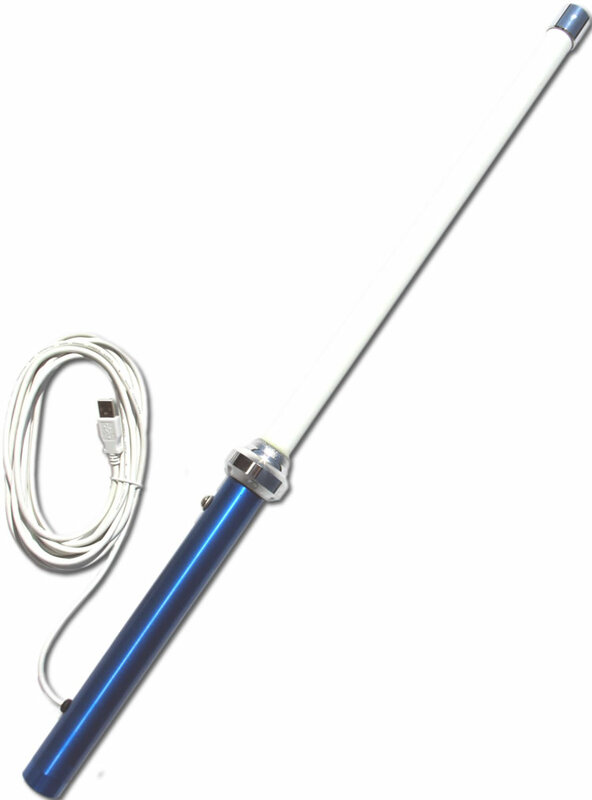 9db or 15 db gain fiberglass antennas, internal wifi card and a USB cable. The antenna is threaded to a 1" marine antenna mount. Perhaps opening a new thread with that in your title may get you updated responses. I almost closed out this thread when I saw the date. Do you plug this antenna directly into or PC or do you use it with a wireless hub? I ask, because I normally run a wireless hub with cellular modem on the boat. Works well for me, but there are times when using a WiFi access point would be handy. Listen to s/v Jedi & Colemj, Coax is bad. Not good in your house (needs amplifiers), why would it be any better on your boat. The radio (Bullet) on your marine antenna is the way to go. A long Ethernet cable from the bullet will not lose signal because its digital down that cable. These systems are simple to set up and come with everything you need to get it going. They just work. I got the standard Island Time PC inline mount system on top of the boat and an Apple base station inside the boat. The two systems work perfect together and I can use my iPad, iPhone, and MacBook all wirelessly. Plus anything else wireless, not just apple stuff. You could also use a different brand of wireless router inside your boat as well. The island time system picks up wifi from outside. I use a web browser to see what is available and has a good signal then I connect. The island time system is connected by RJ45 wire to my apple base station inside the boat. This sends whatever wifi signal I have chosen down to my Apple base station. I set up my own wireless network with my own network name on the apple base station which all my devices link to wirelessly. Even my printer. This network name (i use my boats name) stays the same regardless of what I have the island time connected to. If I feel like sharing, i can set up no password on my wireless and my neighbors can pick up my signal and share the connection. So I can be a wifi hotspot for the other people in the harbor if I want. The whole system is great. My devices are always connected to my internal wifi so I can share files and print wirelessly even when not connected to the Internet. Then when in range of shoreside wifi I just open a web browser and choose a network to connect to. Have a real good look at a router like the Cradlepoint MBR95. This $99 device can do wifi-as-wan, supports 3G/4G USB modems, and has regular WAN and LAN ethernet ports. I currently use it successfully with a Millenicom 3G modem and have a Ubiquity Nanostation M2loco at hand in case long range wifi is needed. If you're an Apple user, also look very hard at the Apple TimeCapsule with 2TB hard disk. You can connect it to the LAN ports of a router (choose bridge-only mode in that case) to take over the standard wifi service. The Timecapsule adds 5GHz 300Mbps mode, wireless Time-machine backups and a shared drive to your network. question - for the hawking signal booster has anyone cut off the 120vac to 12vdc adapter to wire it directly to your boat's 12v system? I'd like to do that but hawking says it'll void the warranty ... i'm wondering how sensitive the unit might be to voltages of up to 14.5 (i.e., when heavy duty battery charging). Thanks! Is there a system that can be set up and operated with an ipad only? Any system that can connect to a router will work. All access is through a web browser, although you may need a computer for the initial setup - depending on what system you get.